If you have been following me on twitter then you know about my obsession with my planner and more recently, with stickers. Stickers were my very first love in this entire world, even before kittens, and I started collecting them when I was three, but as I grew up I forgot about my love for them, until now. I asked my mom yesterday, "Mom, where did my sticker collection go?" And she said, "I don't know, I probably threw them away." I think that is the worst thing I have ever heard to be quite honest, because had she kept them I would have a whole collection of vintage stickers from the 80s and 90s, but it would also mean my mom would be a hoarder, so maybe it's best she threw them out after 15 years of me not thinking about them. I have been a planner addict since college. I discovered my love for the planner during my freshman year of college after purchasing the school's planner at the school bookstore during orientation. I thought I was so cool; I had a college planner. I was so. freaking. cool. That planner ended up catapulting me into a planner obsession that lasted all four years of college, and my most exciting purchase every year was the school's newest planner for that year. My planner, at that point, was for function but not for fun, and I wasn't yet introduced to the love that is colored pens, sticky notes, and stickers (let's not even get started on washi tape, I hadn't even heard of the stuff at this point. Was it even a 'thing' back then?). Here's a picture to show you how well loved (if not very pretty) my planner from college was (I happened to find this in the closet of my bedroom at my parents house and got SO EXCITED to show you!!). After college I struggled to find a planner that was similar in style to my school's planner, but I sadly failed in my quest. I found a small online community that was really into Louis Vuitton planners with Hello Kitty inserts, and I became obsessed with having one. After saving up money earned from my original Glitzy-Glam store, I finally decided to purchase a red Vernis Louis Vuitton planner with the hello kitty inserts from Amazon (this was a huge splurge for me, especially at the time), but after about a month I realized I wasn't using it, I wasn't even liking it, and I made the sad decision to sell it. I ended up using the money made from selling this planner to buy more makeup, which fueled my YouTube channel, which has fueled my planner kick, so it's really come around full circle in the end. The problem with that particular agenda was that the planner was too small, and also I didn't enjoy the rings inside the planner... they would hurt my hand when I would write on the left sides of the pages. After that fail of a planner quest, my love for agendas dwindled for a bit. Fast forward about a year, and the obsession came back. We started selling agendas on Glitzy-Glam, so I grabbed one to use, and I fell back in love. I ended up filming a video on how I used to organize my planner for school, and people loved it. You can watch it here, if you are interested. Once I started using planners again, I started to regret selling that red Louis Vuitton one; it had been so gorgeous and shiny and luxurious. I must have mentioned this in passing to my Mom, who always files things like that away in her head, because for my birthday that year she got me a Limited Edition Louis Vuitton planner. It was the most beautiful planner I had ever, and still have ever, seen. I promptly bought new Hello Kitty inserts and started to use her, but sadly, again after a few weeks, I realized it just wasn't working... the rings were bothering my hand again. Thankfully I didn't give this planner away like the red one because I would be so upset about it now; instead I kept it and used it in my closet "as decoration" (it's that pretty), but as soon as I get back to LA I am going to find a use for it. If anyone has any ideas on what I could use this little purse planner for when I'm already using a big one, please let me know in a comment! My original red agenda on the left, and the limited edition one my Mom got me for my birthday on the right. My planner love didn't come back again until last year, when I first learned about the Erin Condren life planners, and realized that it was set up in the same way as my beloved college ones were. I was sold, instantly. Shout out to Kristina over at PrettyShinySparkly for being the person to introduce me to these planners; I ended up getting the same one she got and loved it. I used her link, and received $10 off. If you would like to receive $10 off, you can order through this link here. You sign up and then you will get your credit in an email. This link is one of those referral links where you get $10 and I get $10 in credit, but obviously I don't need another planner, so last time I used the credit collected through people ordering through that link to give away a couple of planners to readers of this blog. That way, iheartyoucoffee readers helped out other readers! This is my gorgeous planner from last year. It's the Turquoise Gold Foil Edition. I fell in love with that planner, and with it came my love for colored pens and washi tape. My entire planner became a rainbow wonderland of color-coding and pretty patterned tape. I still didn't feel the need to have 1000 different washi tapes; I wasn't obsessed, I just liked my 20 pack of Staedtler Triplus Fineliner pens and a few rolls of metallic washi tape that I bought from amazon. For the record, I still adore these pens, and after a whole year of using them they are still working perfectly and none have dried up. Plus, the colors are bright and beautiful, as you can see in the above picture. Oh, and my little tin of cute washi strips that I thought was so unique and brought so much color and fun to my agenda without costing more than $5 came with me everywhere. Since then a year has passed, and as it was time to order a new planner, I bopped on over to the Erin Condren website and saw that she has pink ones this year!! Omg the excitement levels over this pink planner were through the roof. I ordered a Bubblegum Platinum Foil Edition. It's not going to even ship until the 19th and I am being VERY impatient about the whole thing, but I know it will be worth the wait. The reason her shipping takes a long time is because everything is personalized, so it's all worth it in the end, but I do wish I had it right this very moment. Since then I have been obsessing over planner decorating videos, organizational pictures, and little stationary stores, and I have purchased orders from 7 different etsy stores already, as well as a haul from both Target and JoAnn's (shoutout to Macy over at JoAnn's for being AH-MAZING). I already have a sticker organizational system within a expandable file folder WHICH ALREADY BARELY CLOSES, and my mom thinks I'm insane. I had an obsession like this twice before; once when I got into makeup and started my YouTube channels, and once when I became obsessed with getting a kitten and got Pinecone. I'm a do-er, you know? Tonight I decided, I'm not waiting anymore, I NEED TO DECORATE A PLANNER PAGE AND START ORGANIZING MY LIFE DARN IT! So I grabbed last year's planner, opened it up to a January week I hadn't used (I didn't receive my 2014 planner until late Jan), and decorated it up. I decorated the whole week and then planned out tomorrow (Monday) and some weekly goals and then left the rest blank to fill out as I go. I don't have all my new stickers and accessories that I have ordered from Etsy but I think I did quite well with my Target and JoAnn's goodies. I'm going to use it for this week until my new baby comes. I think I have come a long way in terms of decorating in the years I have had planners, don't you think? Ta da! My new planner! I want to do an entire series of planner decorating ideas and hauls on both this blog and YouTube, and would love a cute name for it like I have for my book reviews, "Glitteratures", and my vlogs, "Glitter Gossips". Any ideas? It can be related to my YouTube name or my blog name, so anything with Glitter, Coffee, Hearts, etc. Please please PLEASSEEEE leave me a comment below with your ideas! I'm also highly considering getting a Kikki-K planner because they are so darn beautiful, but I think the binder rings would bother me the way they Louis Vuitton ones did. For any of you that have a Kikki-K, why did you pick that one over the Erin Condren? Does it hurt your hand? Is it worth getting one to try and compare them? Do you have any name ideas for my planner series? Do you have any ideas for what I can use my little LV planner for since I'm going to be using my big Erin Condren one too? For current planner and sticker addicts: Do you have any favorite Instagram pages or Etsy stores I must check out? 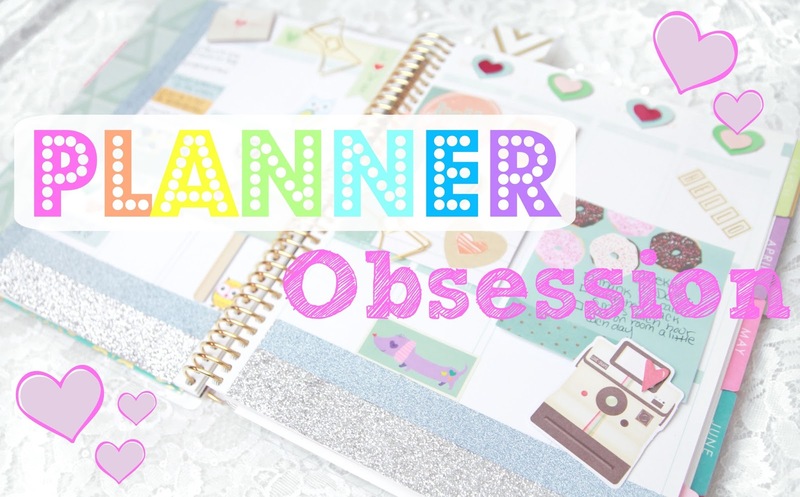 I love planner blog posts and videos, I also adore stickers and I've been wanting an Erin Condren planner for so long! The smaller planner you could use to plan workouts/healthy eating plans. I find it easier to separate those from work/study planners. I've been seeing people talking about bullet point journals lately, they look really cool! You can devise a symbol key (or use stickers!) to write lists of all your ideas, it seems like a good way to use a smaller planner. If you type 'bullet journal' into tumblr there are a few examples. I would love to see sticker hauls! I love my planner and washi tape! I almost bought that LV planner too but I knew I wouldn't use it lol. I can never stick to a planner for more than a month or 2. You could buy journal paper (i think LV sells it but i cant remember) and use it for blog or video planning, note planning, whatever? I'm completely with you on the planner/sticker obsession and would love to see videos!! I'm also obsessed with organisation and planners but being a student it's hard to gather sufficient funds to buy a very nice one! I'm going to do my best to save up for an Erin Condren planner, they're gorgeous! As for the series name.. maybe something along the lines of 'The Perfect Planner' would be cute! Alliteration seems to be the easiest route! I'd love to see sticker hauls too! I am obsessed as well *hangs head in shame*. I'm in Australia so while I have easy access to Kikki-k, I wish we had the Target goodies that all of you in the US have! I'm a little jealous! I am obssesed with planners! I'm using a Filofax Domino in A5 for pretty much a year now and I'm loving it more and more every day using it for EVERYTHING! :) I would love to see you do a planner series showing us your planner organisation and setup, sticker collection, hauls etc! Maybe you could use your LV planner for your YouTube and blog organisation or for projects around your house you want to keep track of? :) There are so many great ways to use and personalize a planner! I've been trying to find a way to integrate a planner into my "adult life" (ie: post-college), and I wasn't sure how. Then I had a bit of a "duh" moment- I have bills with due dates, I have meet-ups with friends, there are birthdays to celebrate! I plan on running out this weekend and getting a planner! the best part about being an adult is that you have a bit more money to spend on the fun stuff like stickers! There's no way I could have afforded that in school. ummm names….Glitterisation (like organisation but with glitter) or all that stickers (like your youtube name). I legit just spent like half an hour trying to come up with both of those, or I don't know I'm thinking like 'secret agenda' or something. Don't know how you've come up with your other series names, that was difficult. My mum has a similar agenda but from Kikki K, the small leather one and she just uses it to write down appointments and stuff when she's out and about to then put on her big calendar at home. Love this kind of posts and EC diaries, thanks to you I know that kind of diary exists! So cool! I've been stationary obsessed lately as well. I still haven't found my perfect diary yet though but I bought a few accesories. Love this post Elle and hope your back is okay and getting better. I love planner and have been wanting an erin condren forever!!! i see however that carrying a big planner around with me all the time is quite difficult, so I have a smaller one in my purse and a big one at home. I guess you could do that with your LV! And you get to decorate twice!! My fav shop is MsWenduh on etsy, she also has a blog and a fb page that makes my feed look super pretty!!! I love that you're back onto blogging Elle!! If I were you I would name the series "Planning the Glitz". :D I am also ADDICTED to planning everything in my life, and my friends make fun of this but it's actually quite useful. You could film about the stickers, about what you have planned for a day, even vlogs. It would be very fun to watch. I'm sending you my regards and lots lots of love from Romania! I don't have a planner but am obobsessed with the videos... I also watch Thatayla and Belinda Selene they do planner videos too... Would love to see a series on this and hauls.. I too collected stickers when I was younger and kept most of mine (thankfully)... I hope u get better soon, I also had a back injury and had to have surgery... Good luck.. call your series Elle's Planner Series..
they're beautiful I've got so much going on this year so definitely need to organise more. Sticker hauls and how you use them in your planner! I don't have my planner yet but stickers are sure a must. I would love to sée a haul! I'm a planner addict too. Started with an EC and Plum Paper used last year, and I got a Filofax for 2015. Have a great day, Elle. Love the planner! I wish I knew about her sooner before I bought the one I have now. I love this planner, but the price not so much. And the shipping to europe is, wow. So this would be great to win. I would so be interested in sticker hauls~! You can use the small planner as a wallet! A lot op people use their small planner as a wallet (mypurpleylife for example). With special inserts you can put a lot of cards in the planner! I bought a Kikki K and I love it! I went for it over an EC just because I love to buy pretty inserts to track workouts/wish lists/blog posts etc. I don't find it hurts my fingers at all with the binder rings. Plus, living in Australia means access to the gorgeous Kikki K stores which I am addicted to shopping in! Would love to see planner "walk though". Maybe you could call the series something like "I heart you stickers/planning"? Also, you could potentially replace the planner paper in the LV one with note paper and use it as an on-the-go notepad to jot down random thoughts or video/blog ideas? Yes to sticker/planner hauls!! 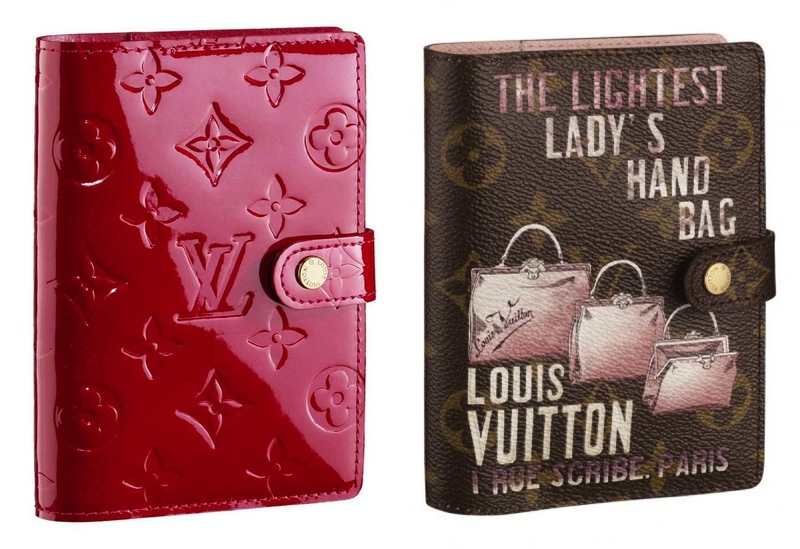 You could use the LV planner as a food/gym diary since its small enough to fit in your purse! Have you checked out the target dollar spot for washi tape & note pads etc! OMG! Sticker haul!? YESS!! I would use the smaller LV planner as a notebook that I keep in my purse for shopping lists, etc. You would probably have to buy lined pages because the calendar that comes from LV might not have enough pages. I'd love to see sticker hauls and planner ideas! I've always used to-do lists instead of planning out my day, but I'm thinking I'd like to try planning again. You could use the LV one as a Pinecone planner. Like writing in everything Pinecone related. All the dates he has, his hair trimming treatments, fun stuff he did, what he discovered and just everything Pinecone did or has to do. I'm sure he has a planner worthy life! One for blogging and maybe one for life plans, so appointments and meetings and social in one and all blog plans and youtube ideas in the other. I'd be interested in sticker hauls! :p Maybe as blog posts? I have the lilac Kikki-K planner! For some reason the lilac went 1/2 price after Xmas. Writing on the left side of the page has already annoyed me a little but it's just so pretty that it won't deter me too much. There are 6 tabs besides just calendar plus a note pad at the back so it's good for tracking projects etc. on Instagram I like jen_plans. Her handwriting makes me want to go back to primary school and learn again! Now, this may seem a bit odd BUT...I'm one of those types of people that believe in the saying, "things happen for a reason"...People come into our lives, things fall into our lap, certain events force us down a path we may NEVER have taken otherwise...These are just a few examples of what I'm talking about. I have the same issue as you. I was obsessed with planners in college and credit them for being the sole reason why anything got done on time while I was an undergrad. I would love to know how you use your planner in your adult life and make it functional in a tech savvy world. love the stickers in your new planner! Where did you get them? I've had a planner for a few years but haven't really used it until now. I got cute stickers and washi tape from Kikki K (I'm Australian) so now I'm motivated! Your blogs and videos will be even more inspiration to keep it up. I would love to see sticker hauls and anything planner related! Your college planner video was what got me wanting one in the first place. I couldn't live without my school diary throughout high school and university, but after that I stopped using one. I think an idea for blog posts or videos could be how to use one for people that don't necessarily have a lot of things to put in it (like if you just have a 9-5 job and no kids etc) and how to stay motivated to keep using it. A name for the series could be GlitStick. Really looking forward to the upcoming series! I am as planner obsessed as you! I decided to splurge on an Erin Condren lesson planner last year (I teach middle school lit in an urban area - my girls love your glitterature recommendations, haha!). I absolutely LOVE IT! I've been weighing the pros and cons of spending the money on another one, or if I should get the Life Planner instead. I've been turning some things around in my head as a name for the planner series, but nothing cute comes to mind. All I can think of is "I heart my: planner" as a play on your blog name. I'm sure a reader/viewer more creative than me will come up with something adorable and clever, though! As far as sticker hauls, I think you should do a big one of this first order, and then after that possible just Instagram your sticker purchases? Oh, and as far as the little LV planner, my suggestion would be to keep that in your purse with a plain pen, and keep the larger planner and colorful pens at home. Throughout the day you can add to the LV planner on the fly. When you get home at night, you can sit down with all your supplies, and spend some Relaxing time adding to your big planner and getting ready for the next day or week, or whatever. I like the idea someone said above of doing a "bullet journal". As someone who also loves colored pens and stickers, I think you could use a different color bullet/shape/sticker for each category, e.g. a pink heart for love life updates, a yellow star for career updates, a red Y for YouTube updates. Let me know what you think! Hi Elle my name is Ashley and I have a great idea for what you can do with your LV planner. You can use it on your travels & make I like your own personal passport & place little trinkets on each state or country you go too. Cute isn't it? Glitz and Plan (like glitz and glam) might be kind of cute for the series.. love the post, Elle! Oh how I love this post! I too am in love with writing my schedule down. This year I picked up a small $1 planner at target just to keep in my work bag. Sadly it's so small there's no room for decorating. I would love one of those big planners to really make pretty and decorate with stickers and washi tape!! Too fun! I adore planners! I've been using my filofax none stop the past 2 years and it's improved my life for the better. I normally use that and a basic planner then for college. Everyone always comments on how organized I am and it's all down to the planners. I need them due to my scatty brain so I write everything I need to do in them so I'd be lost without mine. I even recently got into waishi tape and it makes such a difference to how my planner looks. I got the cutest ones from Cath Kidston. I am obsessed with cute stationary, especially notebooks and planners! I really like the name "Glitter Guide" or "Elle's Glitter Guide" in terms of the guide being your planner/planning supplies like stickers! I've been totally obsessed with planners/stickers since university as well and still use one. There's nothing better than planning out your day AND making it completely adorable at the same time. I can't wait to see more posts. Your Erin Condren planner will be drool-worthy I'm sure! You have also rekindled my planner love. The last 2/3 years I've been using a daytime from Staples. I really enjoy it but it's just kind of heavy to carry around with me. And with a full time job and no hubby or kids yet I found there was just far too much space that was going unused. I can't really plan in my job as so much is constantly changing. I recently ordered the Midori Travelers Notebook and I can't wait to get it. I got the inserts from DIYfish on etsy. You do have to sew your inner pages together into books and it brought back my love for making books again. :) Thank you for resurfacing my love for all these wonderful things (planners, stickers, book making) wether it was mentioned directly or indirectly! I'd love to see sticker hauls! I like to give myself a little sticker on my wall calendar for each day that I exercise. Feels a little kindergarten, but it's fun! The extra planner could be used for meal planning/working out and a sticker haul would be awesome!! So glad you're back to blogging. I love the new planners! -You could use it for things like cleaning schedules, meal plans(Maybe keeping a food diary if that's something you are interested in), work out plans, shopping lists, any lists really like if you have a packing list or something else that isn't a daily to-do list or simply doesn't fit in your other planner. There is lots of uses for that little guy, don't worry. Also maybe to write down if you really like a product/look you want to talk about on your blog or in a video. Or an outfit you discovered and want to wear for a special occasion. I would love to see your decorated pages once you get your new one. You could open the rings on any of the binder type planners to do the majority of your writing and decorating. Then if you need to jot something down quickly, just leave the page in and write it. Veryvivv on ETSY has beautiful planner bands that's fit perfect with the foil series. I had an Erin Condren one last year which I LOVED! This year I bought a similar style one from Etsy, which is really nice, but I just don't love it as much as I loved my Erin Condren one. I've never heard of kikki.K before but the little water intake stickers are SUCH a good idea!! Glitter hearts planners or glitter hearts organization! 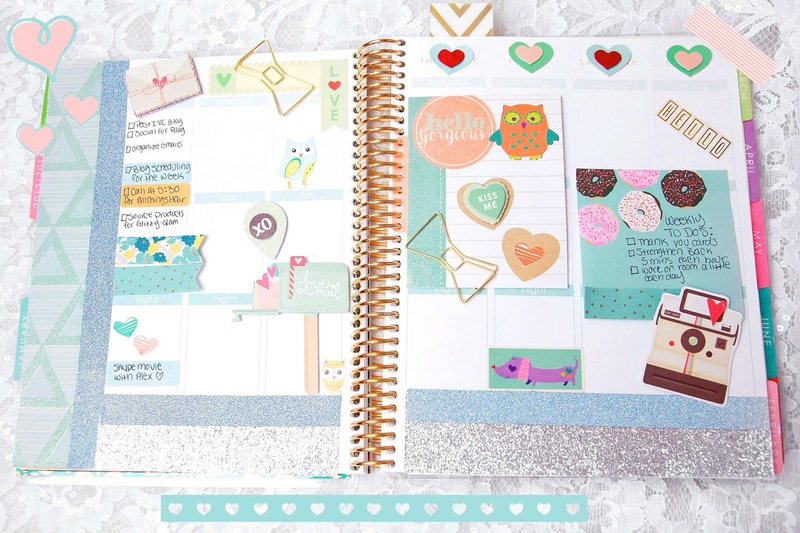 I love the erin condren life planners and have been using them for 4 years! Put envelopes in it and use it for traveling sticker storage, it's too pretty to leave home. https://www.etsy.com/uk/shop/RosieRyeAccessories - Jennifer McFarland is great to work with! God, I just live for planner posts and videos, even if I completely fail at using them myself. Maybe you could post something about that? Like what in your life has changed or benefitted from having the planner. Orrr maybe something about how to use the decorations effectively so they are both cute and helpful! I would really really love to be a planner person. It might inspire me to do things that require planning! For the LA planner, like someone mentioned having ticket stubs and making it a mini scrapbook would be cute. You could also use it as a place to keep shopping lists, idea lists for blogs and videos, things like that. I am all about some sticker hauls, and pens too. I have been using a planner since the mid 90s, I had a 5star for Jr high that was way before its time being decorated and color coordinated. I prefer the ones with rings so I can full on personalize them, but the 6ring ones. I would be interested in sticker haul <3 Is a cute idea. maybe you can use the planner for lists. Like list of things to buy for example. or Use it as a gratitude diary. Write one thing you are grateful about each day. I'm so happy you've fallen back in love with planner decorating! I follow countless instagram accounts so I can swoon over their awesome layouts! I would use the LV planner to jot down last minute things, whether in your purse once you are out and about more, or maybe by your bedside for sleep tracking. Thanks so much for this post! My planner is my life, I would be truly lost without it! P.S. I accidentally listed the wrong name on my entry form - I wasn't sure what my Google account name was. I love the Erin Condren planners but sadly they are out of my budget, especially with the international postage cost. I love my Kikki-K diary though. I didn't get the one with the rings though. I have been debating over going back to a planner instead of using my iPhone and gmail calendars online. I was also really into planners in college! Ever since you started talking about planners on Twitter my obsession with them has grown. I am a planner addict but I had no idea that there was this huge community of planner decorating. I have been thinking about getting an Erin Condren because of the great reviews and all of the research I've done plus I've just graduated from college and I will be starting my big girl job soon and I think that an Erin Condren planner will fit my needs better. I am currently loving the AlexStudio and MyQueenBeeDesigns. Their stickers are so cute. I am also going to have to buy some of those Booga stickers you tweeted about because elephants are my favorite. I would love to see a sticker haul! It makes me excited just thinking about it. Ahh! I literally just posted about my organizers for 2015 yesterday. As far as your LV planner goes— you could use it as a diary/journal. I am the complete opposite. I have my Filofax, which I’m using for my every day planner since it’s portable and can easily fit into my purse. I use my larger planner (from Target, but it’s the same size in dimension as the Erin Condren) that I use as a Project 365 kind of deal. I write things I’m thankful for every day and include pictures and any paper memorabilia that I could glue to the pages. I don’t have any favorite online sticker/planner stores. I’m so traditional— I love collecting them from stores, especially from Korean stores around my area. They always have THE CUTEST stationary and stickers. I love your planner! One of my goals for 2015 was to be more organized and to manage my time better. Keeping a written planner helps me out so much because I remember things better when I write them out. Plus color coordinating is a great way to help me keep things neat. As a college student that helps me because I can color coordinate my classes, cheerleading schedule and they events. 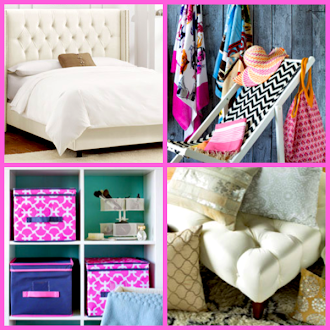 I can wait to see more planning and organizing tips from you!! Especially on planner decorating! Love the foil planners! I think you could use your LV planner for tracking fitness! I would totally love to see a sticker haul! Check out the "We heart EC" Facebook page! I'm so obsessed with my Lilly planner that I spend hours organizing it, especially for the new semester. I love going on Etsy for my stickers, (my favorites are MareBearCrafts and PlannerCandy). Seriously, my planner is the best thing to happen to my college career. An idea for a title could be Organized Chaos with Elle. I have been following your tweets about your planner obsession, and now I'm obsessed too! I have a brand new Day Designer but now I really want an Erin Condren planner too!! I love planner videos and sticker hauls. That is probably because of my own planner obsession. Sticker hauls would be really cool because not all stores in different towns have the same thing and it is fun to see what stores in different towns or states have. Also you could use the LV planner to keep memorabilia from that day on. That is what I do in my school planner after the week is done and I no longer need to see the week at a glance. I just washie whatever it is in my planner like a flap so that I can still come back and look at it if I need to at some point. I'm getting married this year and a new planner is exactly what I need to keep everything organized! Hi Elle! I would love sticker haul videos!!! I'm completing a Wreck this Journal and need ideas! Those Booga stickers you ordered on Etsy are beautiful btw. Get well soon! you could use the little lv planner as a meal planner or for grocery lists. or to track your fitness/workouts. of course after your recovery, or even for tracking your recovery, or taking medicine. you could also use it as a diary for your insomnia. For names : GlitterPlanning or GlitzyPlanning. And would love to see hauls of stickers and planner related stuff! My suggestion for the LV planner would be to use it as a mini scrapbook of sorts, and maybe slot/paste in little tokens like movie stubs, mini photos, etc. I'm so glad you have been to blog again! I would love to see sticker hauls, life planner organization and more all on your YouTube! For names I think you could go with organizing glitter (what a task! ), glitter planning, glitter organization, or iheartplanning. Lastly, I think you could use your LV planner for daily things like meals, dates, lists? I would make the LV more daily and the Erin Conderen Planner more work related, but with some fun stuff included! P.S. I love those pens also, they are perfect for me because while I love color coding my planner, I am also going to school to become a teacher. This upcoming semester I am student teaching and they are so helpful for grading! P.S.S. You are such an inspiration. I really love your videos and blogs! You do such a fantastic job! Feel better soon! The EC planner is perfect for me because I am sight impaired. I can decorate it to my taste and have enough space to write out what I need that is big enough. Sticker hauls would be so fun! I'm trying desperately to get into a routine of using a planner because I know it would be so helpful for school. I'm halfway through my first year of college, and with extra curriculars and school work and a job it gets hard to keep everything balanced and organized in my head. I have a cheap Walgreens planner right now but hopefully these videos will inspire me a little more. I purchased an Erin Condren life planner last night using your referral link. Thanks for the $10 off! One of my goals for this year is to be more organized and productive and I think starting to use a planner again will really help. I loved my planner in university, but I haven't really used one since. I can't wait to get my planner! I think for your LV planner, you should use it as a scrapbook style diary. Decorating the pages won't hurt your hand the way writing on them does. I'd love it if you check out my etsy store. I love using paper planners as opposed to the calendar on my iPhone. I think it's so much easier to organize, not to mention 1000x cuter!!! I would love to see a sticker haul! I don't function without a planner! I have used an Erin Condren for a couple of years. Prior to that, I used filofax. I love planning!! Would love to see you do haul and decorating videos! Can't think of a name but I'm sure you'll come up with something cute. I've ordered a Websters Pages planner and can't wait for it to come in today! They're really affordable and have very cute inserts! They're adorable!! I would love to see a sticker haul. Or a sticker blog haul. I've been wanting an Erin Condren planner for years. They are so lovely. Get well. I love that you love planners! I was worried that after college I would no longer use one but I have found reasons in my job to still use a cute planner :) I do have to fight the urge in Target to not buy a new one every time... They are all just too cute! Worth getting a kikki k planner... its so beautiful and easy to plan things. Love to see a sticker haul! I found you via one of the ECLP groups on FB. Adorable blog, and I'm also newly sticker obsessed again. OMG i am so happy you wrote this blog post because i too had a planner obsession that dwindled and just came back this year! I wanted to buy an Erin Condren planner but they're a bit too expensive for my current budget so i found this Etsy shop called Plum Paper Designs (perhaps you'd like to check them out) that sells beautiful customizable monogramable planners for a more affordable price. But I would love to win the contest so that i can get the EC planner that i originally wanted. Even though its not an EC i CANNOT wait for it to ship so that i can plan and glitterfy, washi tapify, and color codify my life away LOL I would love to see videos where you show us how you organize your planner and show us your stickers and supplies, i think it would be super cute and fun! Oh and maybe you could use your LV planner as a meal/exercise/fitness planner. P.S YASS to sticker and planner related hauls!! I love a good planner, but find that if they aren't easy to use, I don't use them. I couldn't find the right one for me so I ended up making mine and put in a three ring binder. It is bigger than I would like, but I want to get all of the pages that I want/use frequently right before I buy something more expensive. It would be great if you did a sticker haul/ decorating ideas video! This is a lovely post - very unusual. You should call the planner series ElleHeartsLife or A Life of Glitter Goals. Glad you're feeling a bit better. I want to see sticker hauls/planner videos! Elle, I just wanted to express how excited I am for this series! I'm in a similar position as you, I'm not allowed to leave my bed for an indefinite amount of time due to recent surgery. I've always been kind of an organizational addict and I've watched all you agenda and stationary videos like a million times. Seeing you get re-obsessed with your agenda and pretty-fying it has gotten me re-obsessed with my agenda, even though I have nothing to schedule for a while. -Sending you warm hugs from cold Minnesota, Josie. Ah I think it deleted my original comment while I was signing into google! Sorry if it's here twice! Also, PS: In my entry above I put that my name would be down here as Lindsay F. and I can't seem to change it but I just signed into my google so now it's different!! For the LV one, see if the Project Life cards fit! Turn it into a super adorable decorated scrapbook! I received a Day Designer planner from a co-worker for Christmas and then I saw your tweet about people instagraming their planner ideas and now I am OBSESSED!!! I would love to see a haul and your favorite Etsy stores to shop for stickers! I love your idea. I love planning and I think that it's too important for our lifes. This year I would like to be better planning my life and I think that your videos would be perfect for me. I loved when you talked about your agenda in the video. Wow this planner goes above and beyond. I can't even imagine. As for the smaller planner maybe use it for family/friends related things instead of work? I'd love to see videos on planners and decorating them. I am new to this whole decorating planners with washi tape. You could possibly use your old LV planner to hold receipts, a small notepad, or an address/phone book. You could call it Glitter in My Coffee or I Like Coffee in my Coffee. And, yes, even as a grown woman I would enjoy sticker hauls, etc. thanks, Elle! YES to sticker and planner vids. I don't have any insta pages or etsy stores but I would love to see links to some of your favorites! Hey Elle! I would LOVE planner and sticker videos/hauls! I'm obsessed too! And by the way, your planner looks BEAUTIFUL! I love organizing my planner with stickers and notes. It helps since my style changes on a month to month basis and I like to have a different motif for the month. This year I'm trying the bullet journal system... Last year I tried to be more organized with my A5 Filofax but I abandoned it mid year. Do you have any name ideas for my planner series? Maybe something like "The Glitter Pages" or "Coffee Break with Elle"
Do you have any ideas for what I can use my little LV planner for since I'm going to be using my big Erin Condren one too? I would use the LV planner as a "to go" planner & only write things I need to know when I'm away from the house... Bonus - it has slots for credit cards, so no wallet is needed! For current planner and sticker addicts: Do you have any favorite Instagram pages or Etsy stores I must check out? My favorite instagram for planner pages is @lindseyplans - it's so cute! I would love posts and videos all about your stickers and planner. How to other people use planners and how do you use your stickers with it!! Also, I would love sticker hauls! I am slightly obsessed with planners as well! They help so much in keeping organized, especially when you're always doing something new. I really enjoy Organized Like Jen's planner videos, she does some great comparisons (including talking about the Kikki-K planner) and she's extremely thorough. If you haven't checked her out yet you definitely should! I would absolutely love to see sticker hauls. I find hauls fun, not necessarily for seeing what I would like to buy (although that is good too), but just the excitement of the person doing the haul. Whenever I go shopping and see my mom right after (more so when I lived at home, but sometimes where we're traveling still) and she says "Show me your wares" and we go through each thing I bought, it brings about the excitement of shopping all over again! You could use your LV planner for projects with timelines. You can include these in your regular planner, sure, but if they have their own planner you can break it down even more and you don't have to worry about fitting in other daily life type things as well. Also, if the rings hurt you, you could always remove the page to write on it and then replace it when you're done. Not so convenient for an everyday planner, but if you're using it specifically for projects you're most likely getting down to business and actually planning, so you don't need to be writing something down super speedily. I don't have a specific recommendation for your planner series name, but something to keep in mind is that you should make sure there is a word in it that definitely let's people know that you're talking about time management and/or planners, just so that people who aren't subscribed can come across it more easily and fall in love with you and your content too! Hmm.. I entered my name as Amalie Thomsen in the rafflecopter, and now I don't know how to chnge it :( - Nevermind! THANK YOU for this great blog and everything else you do :* You are a true inspiration to me. Would love to win the giftcard, have heard so many amazing thing about EC. I have never been a planner user but this post makes me want to get into it. :) I would like to see sticker hauls, and i really like organization posts and videos. I have only binders with rings so far because I need to be able to personalize EVERYTHING. I like being able to customize, remove things that aren't relevant, tidy up, add new sections or inserts, and have complete control over my whole planner system. I have a few kikki k's because they're gorgeous and functional and motivate me to get stuff done. I would love to see things such as sticker hauls! I adore planners! I've been using one for years and the Erin Condren's look amazing so thank you for sharing since I've never heard of them before you. Maybe you can use your LV planner to write your daily goals? I used to write daily goals first thing in the morning, and it always helped me stay motivated. Feel better! You could use your LV for a fitness tracker/journal, for blog planning, as a gratitude journal or as a "high level" planner (monthly inserts with appointments and then addresses and stuff behind that). I would absolutely adore an Erin Condren life planner, but they are too expensive for me right now! I have wanted a Erin Condren planner for so long now but could never justify spending that type of money on one because I never stick to planners. Also I love how you decorate and color code yours, it's super cute! I have an Erin Condren planner that I absolutely love! I use it to keep track of all the fun activities and trips I have with my son. I like to write down quotes I randomly come across as well to look back on for inspiration if I need it. I also got colored pens just for my planner to keep everything organized and color coded. One of the best purchases I have made!! Oh my gosh I have a sticker obsession too! Only I new know what to do with mine so I never end up using them and I just have a ton. I love planners too and I am so so picky about the kind I get. I need lots of room to write things. The only thing is I typically don't use them during the summer, so I really only need them during the school year and most of the planners I like (these for example) are for the whole year of 2015, instead of the 2015-2016 school year. Elle I found this post fascinating! I also love using planners, there is something ever so satisfying about keeping your life organised in one place! Thank you for sharing! you could use the LV planner for on the go ideas to write down, or if you remember something while your out so you don't forget to write it down on the big one :) and yes, i would ttly love a sticker haul!! Elle!!! I'm so happy about your love for planners!! Your series should be called OrganizedElle, which leaves it more open! I am launching a ETSY today!!! eeee! I am so excited, it will be printed filofax personal inserts for now! But will be expanding as the year goes on! I'm pretty shy but the feedback has been great, I'm already over 100 subscribers!